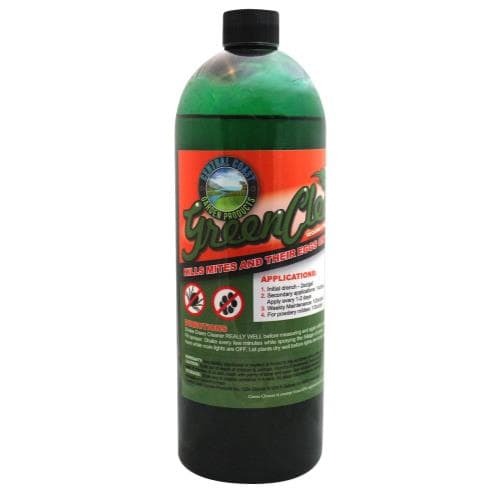 Spray Green Cleaner on plants of every age, from clones through harvest. Unlike other products, spider mites do not get immune to Green Cleaner. Kills mites and their eggs. Washes powdery mildew right off the plant. All natural, you can even use Green Cleaner on the day of harvest. 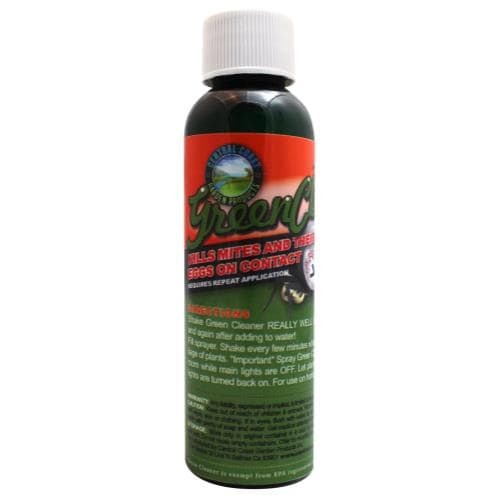 Green Cleaner combines all-natural pesticides in a concentrated form. We start with organic soybean oil and sodium lauryl sulfate. The soybean oil acts to quickly suffocate pests, such as spider mites, broad mites, and russet mites, while the sodium lauryl sulfate coats bugs in slimy goodness to immobilize them. We then add specific proportions of citric acid and alcohol. The citric acid infiltrates the soft-bodied insects exterior to acidify and destroy them. The alcohol is a key ingredient that both dehydrates the bugs and evaporates any remaining residue of the oil and sulfate. The result is a concentrated combination of pest killing power. 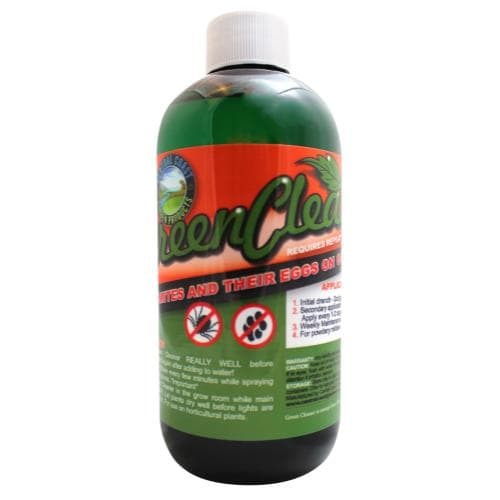 Green Cleaner is also very effective against the common fungus, powdery mildew. Powdery mildew is a problem so prevalent, that it effects growers from coast to coast, and is a constant source of irritation to gardeners in temperamental climates where humidity is difficult to control. PM is a disease caused by different species of fungi. Each species attacks specific or wide varieties of plants. The asexual production of spores can reproduce in as little as 48 hours. The spores move from plant to plant by wind, insect contact, and even gardeners. Many times outsourcing new plants and bringing them into your garden can bring in unwarranted spores of PM. Infection is favored in high humidity (50-90%), especially during nighttime or “lights off” hours, when temperatures can fluctuate between 60-80 degrees Fahrenheit. “More than 500 species of insects, mites, and spiders have developed some level of pesticide resistance since we began spraying them. In any population there will be a few individuals that possess a mechanism to survive exposure. Over time, the resistant few will produce generations that contain this resilience. Spider mites are notorious for rapidly developing resistance to miticides in almost all fruiting crops worldwide. 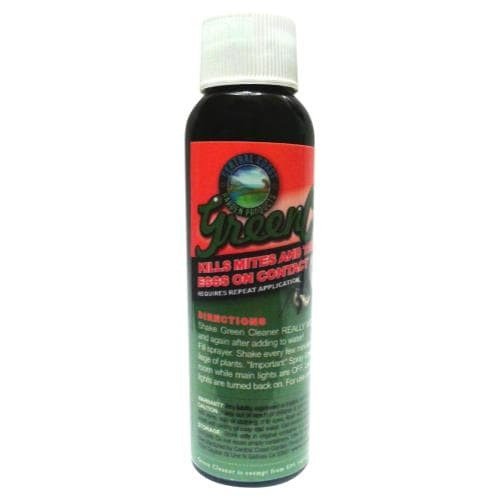 Ultimately, the once-effective product no longer controls the resistant population, which is why we suggest Green Cleaner. The answer to your pest and disease woes is actually very simple and made from common ingredients. Our customers in both indoor and in outdoor gardeners are giving us great reviews and feedback to pass along. It dehydrates powdery mildew with a single application and coats the spores to limit any further infections. Wash powdery mildew right off the plant. While we find that most people are using it to control powdery mildew they are also finding it is helping make the growing environment inhospitable to all kinds of mites and other soft bodied insects like: Thrips, Aphids, Whiteflies, Leafminers, Fungus Gnats, Broad Mites, Russet Mites, and Spider Mites. 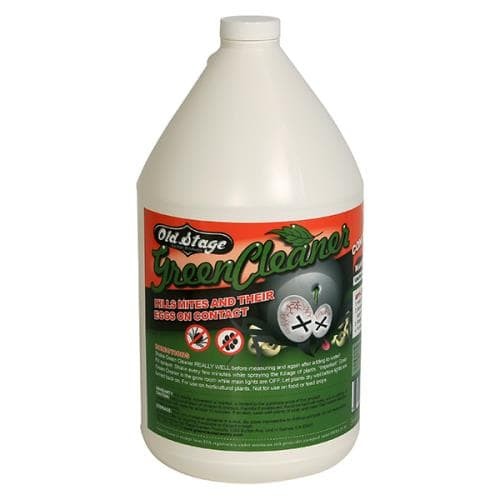 Spray Green Cleaner on plants of every age, from clones through harvest. We find that 1 ounce per gallon used on the entire plant top to bottom 2 days in succession does the trick. If you are spraying Green Cleaner indoors, spray with grow lights OFF & wait until plants are dry before turning lights on.